In 1995 Phil Spence registered the hybrid between Dendrobium engae and D. convolutum as Dendrobium Gerald McCraith. The two parents have flowers that last in good condition for ten and twenty weeks, respectively, surely a reflection of the great age of one of Australia’s veteran orchid-growing icons. Gerald, now 97 years old, has grown orchids for well over seventy years, having first joined the Victorian Orchid Club in 1931. 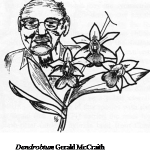 He is particularly well known throughout Australia as a co-founder of the Australian Orchid Foundation (with the late Hermon Slade) in the 1970s. Dendrobium Gerald McCraith produces 3-15 fragrant flowers, each 50-60 mm across, on inflorescences averaging 250 mm in length. Dendrobium engae is named after the Papua-New Guinea province of Engae, where it is found growing on tall trees at elevations between 1800 and 2700 m. Rain falls throughout the year in this region. D. engae is a cool to intermediate-growing orchid that can withstand quite high light intensities. Its inflorescences bear 2-7 flowers, each 30 mm across; the flowers are mostly produced between spring and autumn. D. convolutum is found at altitudes between sea level and 650 m, and it therefore requires more warmth than D. engae. Both species enjoy wet conditions in nature and neither should be allowed to become dry in cultivation. My plant of D. Gerald McCraith is currently growing in a 175 mm plastic squat pot containing a potting mix comprising three parts of composted pine bark (10-15 mm) and one part of Absorbastone®. It made two new growths last year and another two this year. I’m pleased to report that all four of these growths are longer and fatter than earlier growths, the latest pseudo-bulbs being 240 mm tall, their leaves adding a further 120 mm. My plant flowered this year for the first time, the 130 mm inflorescence bearing ten flowers, each 40 mm across. The perianth segments are apple green, similar in colour to those of the D. engae parent, but the labellum carries characteristics of each parent, both in the burgundy colour and in shape; the mid-lobe of the labellum is wider than that of either parent. D. Gerald McCraith seems to enjoy similar conditions to those that I provide for my hot/cold dendrobiums and odontoglossums, namely, a temperature range of 5-25°C. During the growth cycle I fertilise with homemade liquid fertiliser made from animal manure; I water throughout the year.